Good Monday morning stamping friends! I hope you all had a wonderful weekend! We had some gorgeous Fall weather here in Northern Virginia - it was 72 degrees yesterday! It hardly seems like the time for me to be showing you this wintry looking Christmas Card - but the season will be upon us soon enough and I know you are looking for some simple, but beautiful ideas! This card is actually cased from a swap that I received at Founder's Circle this year. The beautiful original was stamped by Brenda Keenan and can be seen here. I was so happy to be at Founder's again this year, it's a fabulous honor, but also, I came home with so many great swaps and ideas. It was like plug and play getting ready for my classes that I had when I returned! As you can see from the photo of her card, I didn't change much, but just simplified it a bit for my Christmas in September Card class. We made 10 cards that day and quick and easy was the order of the day. Plus, I don't own the punch she used for the snowflake, so I just eliminated it and moved the stamped trees over a bit. I added the star to each tree with Silver Encore ink and shifted the knot in the ribbon up a smidge. The hills are drawn on with the 2 Way Glue Pen and then covered with Dazzling Diamonds Glitter. I love the contemporary feel of this card, it's simple and elegant all at the same time. 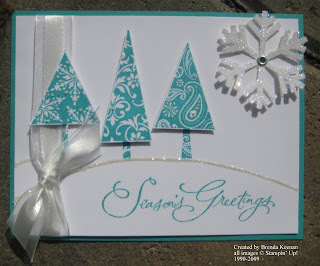 You don't need a ton of supplies to make it either which makes it nice for creating a cost effective card this year. I've included the supply list for you below - everything is Stampin' Up!, of course! Have a wonderful Monday - I'm in for a busy, but fun day. I'll be at the Tall Oaks Community Center in Lake Ridge this evening doing a stamp camp. If you want to come, send me an e-mail today - I'm still cutting supplies, so I can include some for you if you want! OK.. so I HAVE to try this color combination. At least this time I have the stamp set :-) It's fabulous. I like this a lot! it looks more balanced without the snowflake, i think. and love the color combo!